There are hundreds of shipwrecks buried under the sands of the Wadden Sea near the island of Texel off the coast of North Holland. A natural barrier between the North Sea and Wadden Sea, Texel was an important center of maritime trade. Ships anchored in the Texel roadstead, a sheltered area in the lee of the island, waiting for propitious winds, waiting out bad weather or taking on crew and cargo, only to be wrecked in sudden unexpected storms. Many wrecks are protected by the sand, but as currents shift they can be exposed to the more damaging elements of sea. Divers from the Texel Diving Club keep an eye on the condition of wrecks and recover artifacts that have been unburied and are in danger of destruction. In August of 2014, divers discovered that artifacts from one known wreck, a well-armed merchant ship buried since it sank in the 17th century, had been exposed. They didn’t know what the objects were at first. It was just a bundle in the sand. It was only when the brought the bundle to the surface that they realized they’d recovered antique textiles. The find was not announced to protect the site from interlopers while conservators examined and stabilized the finds. 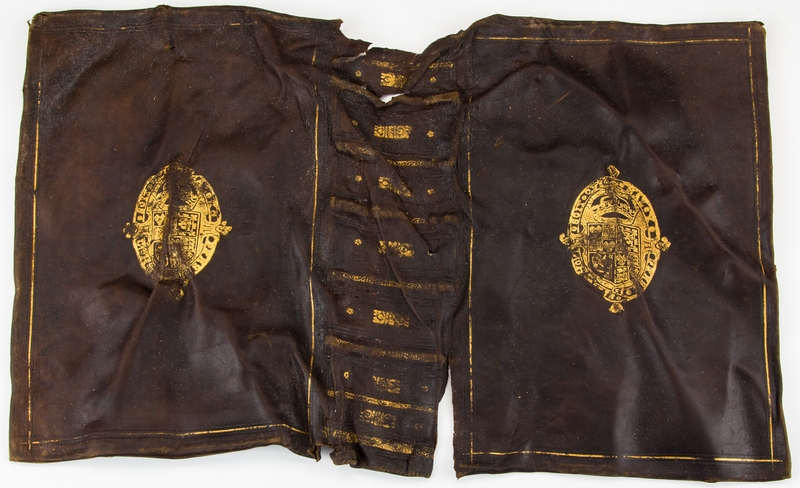 Conservators discovered that the bundle included a unique survival in exceptional condition: a silk damask gown of such high quality that it must have belonged to a noblewoman of very high rank, perhaps even royalty. Buried under the seabed for 400 years or so, the delicate silk was spared the ravages of both oxygen and animals. The dress has a bodice with loose-fitting sleeves and sleeve caps and a full pleated skirt open in the front. The neck has an upright collar. The style is of a type seen in paintings from the early 17th century. The dress is just one element of an extensive wardrobe that includes a jacket, silk knee socks and silk bodices woven with gold and silver thread. All of these pieces are the same size, so archaeologists believe the clothes belonged to one full-figured woman. Only the gown shows signs of significant wear, which suggests it was intended for everyday use, as does the lack of rich silver and gold embroidery seen in the bodices. Other artifacts were recovered from the wreck site. 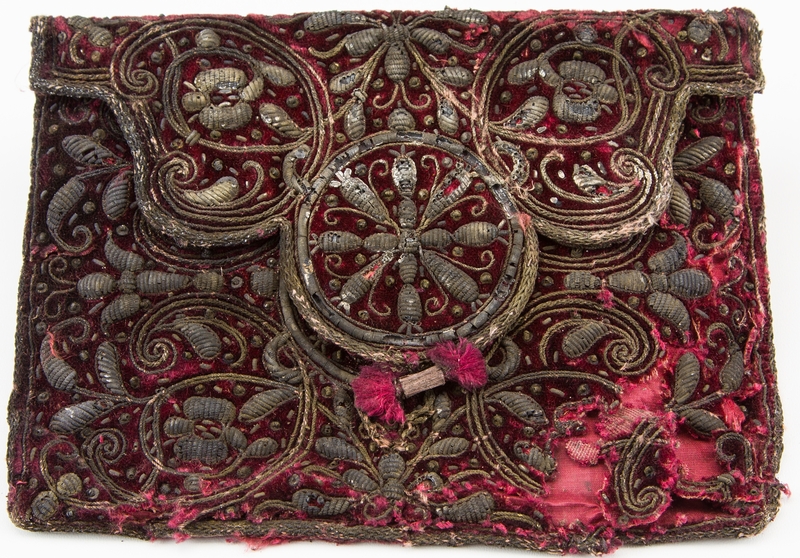 There’s Italian pottery, a silver gilt vessel, a red velvet pouch embroidered with silver thread that contained a two-sided lice comb made of cow horn, pomanders (openwork spheres that held sweet-smelling flowers or herbs for elegant people to sniff when the environment was particularly rank), and a number of leather book covers in different sizes, some with locks. One of them is stamped in gold with the coat of arms of King Charles I, which suggests at least part of the cargo was Stuart property. Perhaps the lady with the very fine wardrobe was a member of the Stuart family. In addition to the passenger belongings, the ship’s cargo was remarkably varied. 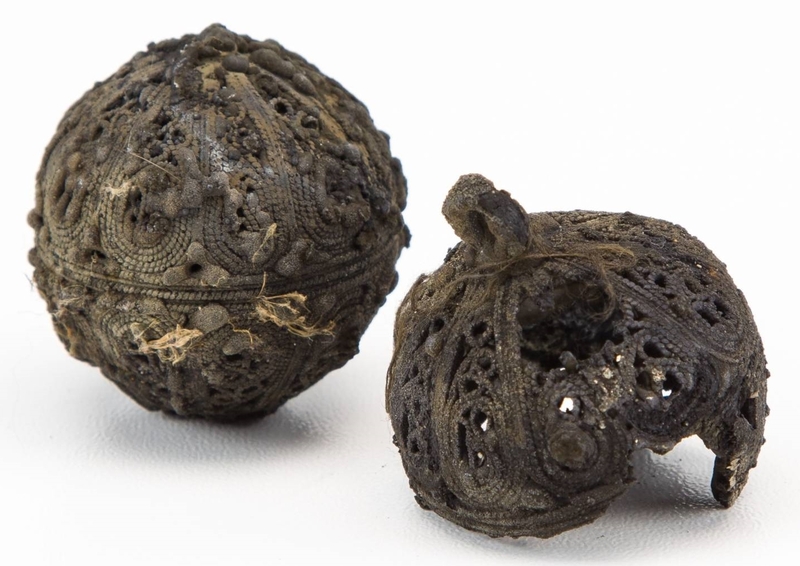 In addition to the wardrobe and expensive personal belongings, the ship was carrying boxwood — a dense, fine-grained wood widely used for musical instruments, chess sets and decorative carving — mastic from the Greek island of Chios, crates archaeologists believe held frankincense or myrrh, tobacco and aniseed. 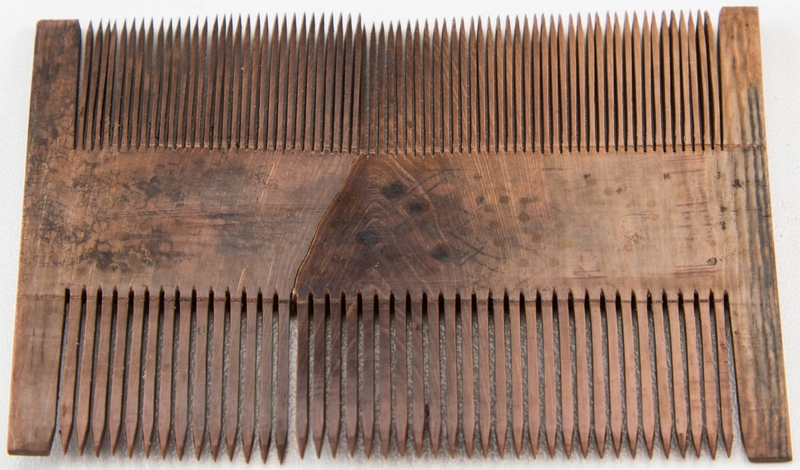 These objects found at the same time in the same context make the find a priceless historical time capsule that sheds new light on trade, politics and how people lived and worked on ships in the 17th century. The gown and other treasures are now on display at the Kaap Skil Museum on Texel. The finds belong to the Province of North Holland. After the month-long exhibition ends on May 16th, the artifacts from the wreck will be further studied and conserved at North Holland’s Huis van Hilde archaeology center. 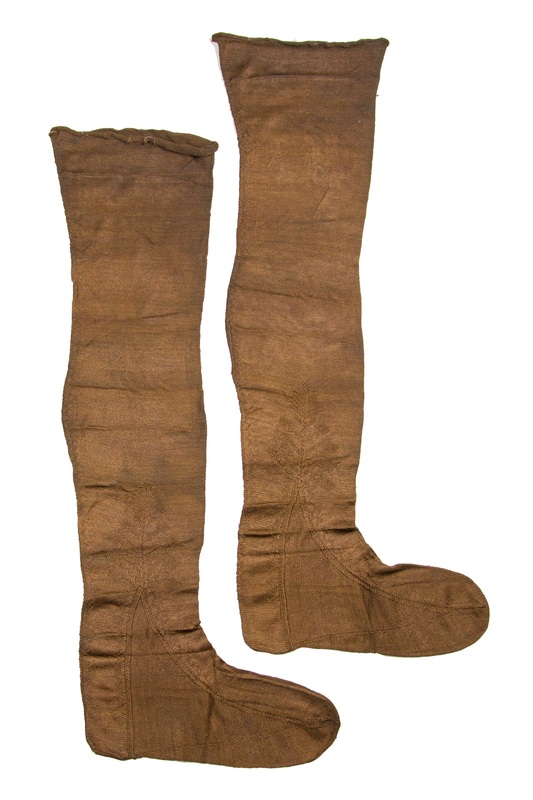 Once the research is complete, the Kaap Skil Museum will display the finds in a permanent exhibition. UPDATE: The likely owner of the gown has been identified. This entry was posted on Friday, April 15th, 2016 at 4:52 AM	and is filed under Modern(ish), Museums. You can follow any responses to this entry through the RSS 2.0 feed. You can skip to the end and leave a response. Pinging is currently not allowed. I read a short news story about this yesterday evening and was hoping you would mention it here. I love this this find: An unexpected, important textile find, so close to home! And thank you for the usual large-format pictures. On the image of the dress, you can see a little sketch, clearly made by one of the people studying it. That actually really helps to understand the design. It actually makes sense that there are loads of shipwrecks near Texel because that ships would pass there on their way to and from Amsterdam which was the Netherland’s main trading port at the time. Even the Charles I connection would kind of make sense in that context: His daughter Mary was married to Stadhouder Willem II and even though her position in the Netherlands became a bit complicated after the early death of her husband, the Stuarts and their supporters (exiled from England after the civil war) did visit her, stay in touch and ask her for money. Anytime you’d like to make one of those velvet pouches, I’d be glad to take it off your hands. Given the high status of the clothing and other articles, it should be easier to determine what ship it was. People of that class did not usually disappear or have an accident without someone noting it down. Too true. The sister of the king noted this one down. I have been doing a lot of reading and writing about the Huguenot silk industry, centred in the UK largely after the 1685 expulsion. 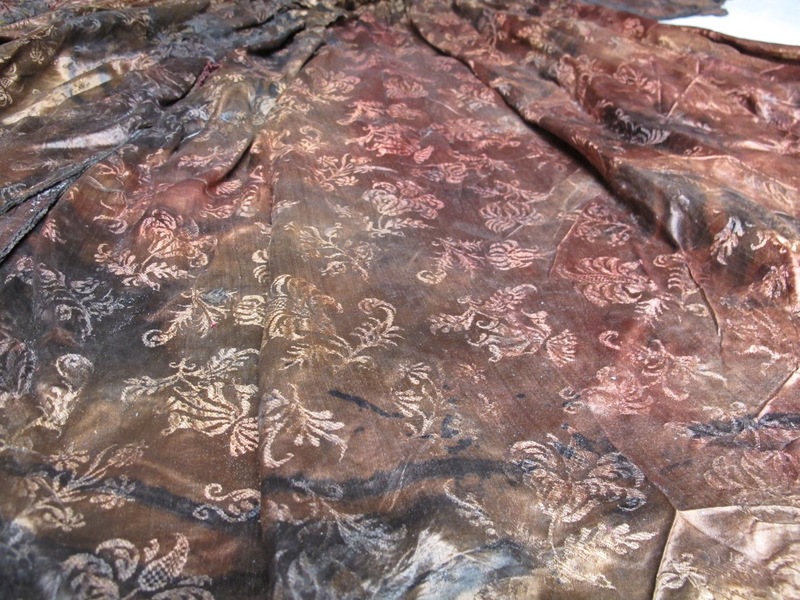 So I have seen silk damask gowns of high quality before, but never taken from a ship wrecked merchant vessel. As well as being beautiful, silk must be the most amazing material to survive hundreds of years! Burial in the sand saved it, I’m sure. Silk and water don’t like each other very much. We have Stuarts in our family suppose to be to the relative to Mary Queen of Scott. Groovy. She only had one child, but he did make it to the throne of England. What impressive weaving and embroidery. I am awed by the skill it took to design and create this beautiful garment. I wish I could know something about the artisans involved and the processes they used. France, Italy and Flanders were the centers of European silk production, but there was a growing native English industry during this period. …and the threads of all the Stewards in my family drive me DOOLALLY !! Your comment made me doololly. I just want to say I love reading the comments almost as much as the posts. Thanks to all who comment. Apparently the gown belonged to Jean Kerr, the Countess of Roxburghe, one of Henrietta Maria’s ladies-in-waiting. That was fast! I’ve written an update to the post. The fact that “burial in the sand” preserved these things from both oxygen and animals” reminds me of something I was reading recently about anaerobic layers of water in the Black Sea, where objects are similarly preserved – to the extent that the frame of an ancient ship appears to be very recent. Good job, divers! 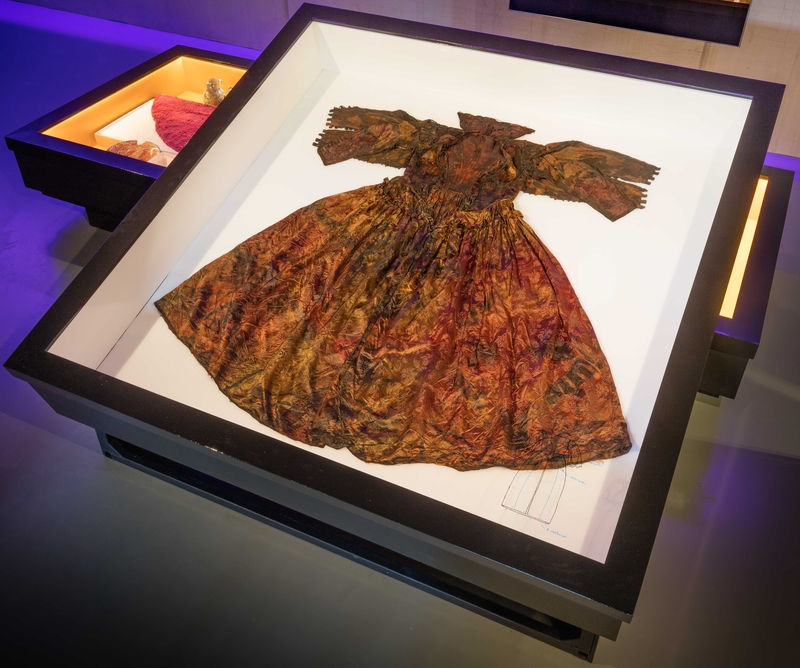 I am so amazed by the survival of a dress in seawater for over 350 years. I would have thought that seawater would have destroyed it! Do you have any links to the Black Sea information you mentioned?